Using WSUS Offline Update, you can update any computer running Microsoft Windows and Office safely, quickly and without an Internet connection. You can use WSUS Offline Update to easily download patches and updates for your Windows and Office without going through the whole procedure on Microsoft's Windows Update website. Operating systems are sorted by version and language. 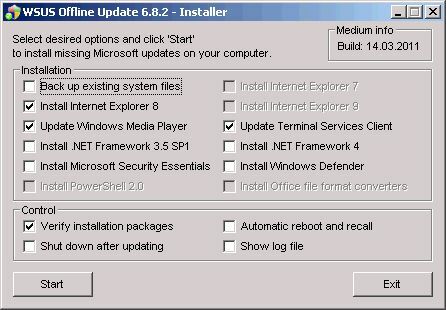 It is possible to select multiple updates at once, for instance for Windows 7 and Office 2010, or different languages. Several options are displayed at the bottom of the screen. It is for instance possible to create ISO images that can be burned to disc, include service packs, the .NET Framework, Microsoft Security Essentials and Windows Defender definitions in the update or copy updates directly to an USB stick.